I love it when I can get out of the store for just the sales tax. It doesn't happen often but when it does, it's a real rush! Even more exciting is when I don't realize that's how the coupons are going to add up! Today's shopping was a big surprise. I expected my total to be around $2 for 10 cans of cat food and cooking spray. 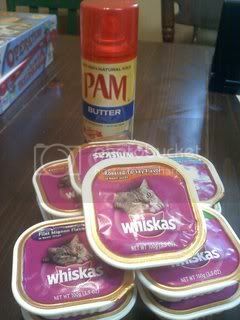 It turns out, my cat food coupons doubled to make both cans FREE and I had 5 cents overage on the cooking spray. After that fun experience, I came home to print some additional coupons only to find I was out of ink! No worries there since I had an Office Depot rewards card from recycling ink! I was able to pick up ink absolutely FREE! So my savings today is 100%! Tonight's dinner is also a next to nothing meal. Dinner for 8 for under $3! Creamy Pizza Baked Spaghetti is an adaptation of a Rachael Ray recipe Neapolitan Baked Ziti. I've posted the recipe before, but for this version we add in sliced pepperoni and use jarred sauce. I also serve some steamed broccoli and rolls on the side. The sides come up to 75 cents! Prepare pasta according to package directions. Drain. Place a medium-size saucepot over medium heat and melt the butter. Add the flour, stir to combine and cook for about a minute. Whisk in the milk, add the bay leaf and season with some salt, pepper and a couple of grates of nutmeg. Bring up to a bubble, turn the heat down to low and gently simmer, stirring frequently, for 5 minutes. Remove the bay leaf and discard. Combine the cooked ziti with the red sauce in the pot the pasta was cooked in and transfer everything to a baking dish. Top with the pepperoni and white sauce. Sprinkle the mozzarella over the top, transfer to the oven and bake for 25-30 minutes.